Meerkat babies start life deep underground in a birthing chamber lined with grasses. There are usually 3 to 4 in a litter, and they go by a few different names. 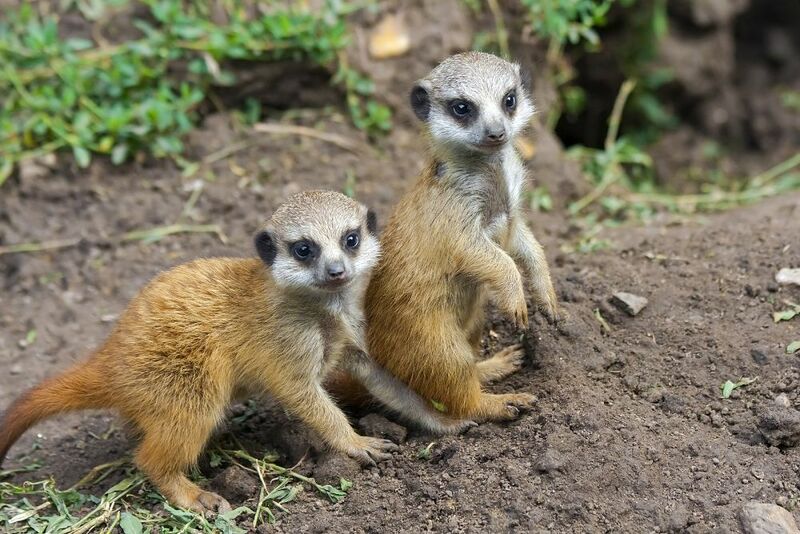 Baby meerkats may be called pups, puppies, kits, kittens and sometimes cubs. The most common name for them though, seems to be pups, probably because, even though meerkats have "kat" in their name, their social, playful behavior may seem more dog-like. 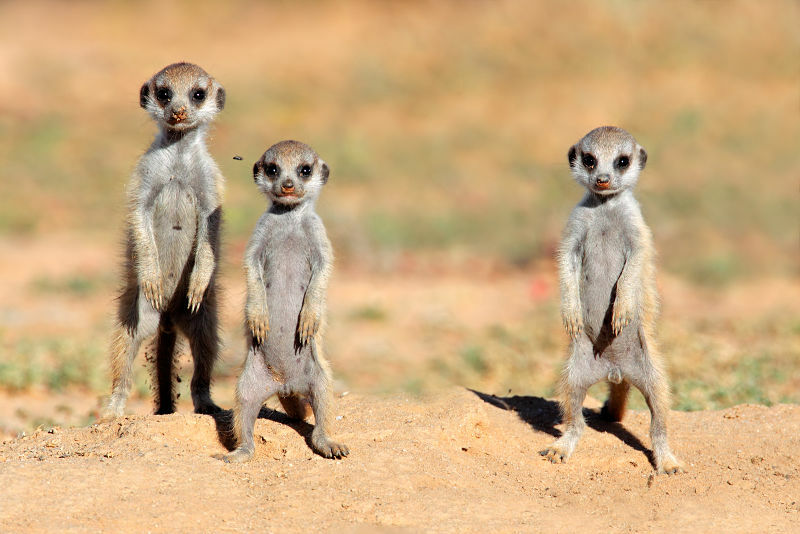 Although there may be 30 members of the meerkat colony, called a mob, generally only the Alpha male and female meerkats mate. A few days before she goes into labor the pregnant Alpha female leads the troop to one of their larger dens, often one specifically used as a nursery. The birthing chamber will be tidied up and lined with soft grass, and after an 11 week pregnancy, the female will give birth to an average litter of 3 to 4 tiny babies. Newborns are only about the size of a Matchbox car, their eyes and ears are shut, and they are framed with a wispy halo of very fine, sparse hair. Baby meerkats ears will open at about 10 days, and their eyes take 10 to 14 days to open. The pups stay underground with their mother for the first 3 to 4 weeks of life. When the mother goes out to forage with the mob, she leaves her newborns with babysitters who may be male or female, and if female, may even serve as wet-nurses. Some subordinate female meerkats actually begin to lactate in the presence of the newborns without ever being pregnant themselves, so they can help nurse the babies when the mother is tired or out feeding. Pups are fully mature at 2 years old, and young males especially, may consider leaving the troop to establish themselves elsewhere. Young females may be cast out by their own mother at as young as 10 months, if she becomes pregnant, or the Alpha female views her as a threat. Occasionally groups of brothers or sisters will leave together and attempt to form their own mob, or join another. Some individuals, however, remain subordinate their entire lives, never attempting to breed, and simply serving the needs of the Alpha pair and their new litters. Once the babies leave the burrow, the entire mob helps with their upbringing. 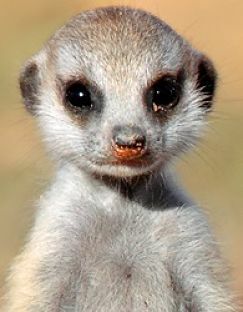 But each baby meerkat will be assigned a personal mentor, who teaches them important life-skills, like where to dig for grubs, and how to disarm a scorpion. This teaching is precise and systematic, with the mentor first simply providing prey to the youngster, then presenting the youngster with disabled prey, encouraging them to complete the kill, then just observing and giving pointers as the student begins to master the art of the hunt. Babies are fully weaned at about 6 weeks, are foraging on their own at 3 months, and begin to take on jobs like babysitting and sentry duty at about a year. The mentor relationship does not continue, and the newly grown meerkat may soon be taking on a student of their own. 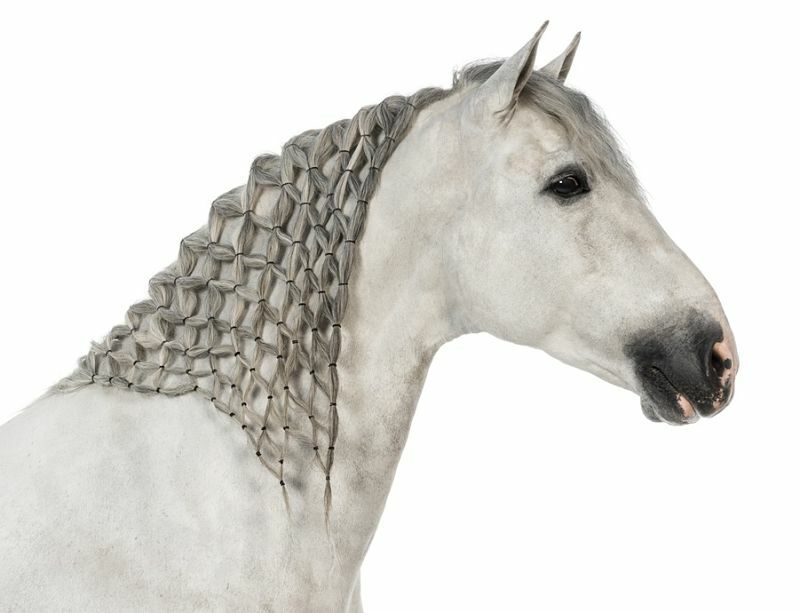 The long mane is sometimes braided in a pattern called "plaited"